Offer of the Day - The mentally retarded little red-headed step-cousin twice removed of Woot! Save on Some of the Hottest Laptops! Potty Train Your Kids the Right Way! Meet the SCARY Toilet Bog Monster. Besides being scary, he apparently loves the smell of human excrement. He’s smiling because he’s doing what he loves to do … what he was born to do; and that’s scare the ‘crap’ out of people … LITERALLY. Seriously though, if you have a kid that’s scared of monsters, why not make this kid confront his/her fears the right way; by secretly installing this toilet monster in your kid’s toilet after making him watch his first horror flick. Before tucking your kid in, make sure this little wimp drinks plenty of water, under the guise that he needs to be properly “hydrated”. And, when you hear the little wuss screaming for you in the middle of the night, take a minute for yourself and enjoy the moment before heading to the bathroom to do some “comforting”. When your “so-called” son or daughter grows up, you’ll thank us for setting them straight. But don’t just thank us, thank the Green Bog Monster. And, if you thought this was a SERIOUS forum about potty training, please Click Here. Green Bog Monster Halloween Toilet Prank - New and improved with even more gruesome teeth than before2. Try the ultimate bathroom prank on your roommates, your family or your houseguests. Attach the bog monster to inside of the toilet rim and seat cover with the attached suction cups. Then, wait for your unsuspecting restroom visitor. Painted, rubberized Toilet Monster easily attaches or detaches to your toilet seat in seconds with 8 built-in suction cups. It’s nearly impossible to tell it’s there under the lid, waiting to shock your unsuspecting victim! 13 x 15″ and washes clean with mild detergent. PRODUCT WARNING: The Bog Monster should not be used on the elderly or AND those of weak disposition!!! They should make a brown version of the monster for obvious reasons. They should also design a monster that has his mouth open, as if he wanted to eat your crap and get drink your urine. 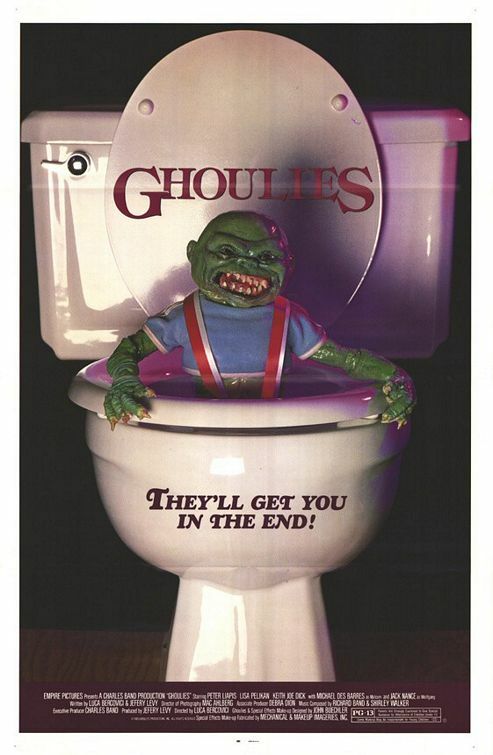 A perfect movie to show your kid before you tuck him/her in is Ghoulies (1985). If you are a current member, click here to login. Want to Join? Become a Member. © 2007-2010 OfferOfTheDay.com (Offer of the Day), All rights reserved. OfferOfTheDay.com holds no affiliation with any of the listed products or their companies.